清水LNGアンローディングアームと富士山. Image source: Wikimedia Commons. What happened to the spirited U.S.-Japan discussion of American liquefied natural gas (LNG) from five years ago? 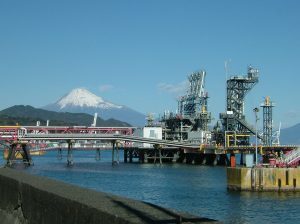 It has quieted down as U.S. LNG has started to enter and transform global markets, and as Japan has begun to deregulate its gas market. If not yet “conventional,” American LNG from shale is no longer an “unconventional” fuel on the global market. Japan’s overwhelming focus on the security of energy supply is yielding to discussions of spot prices, hedging, and futures. The International Energy Agency’s prediction, based on the U.S. shale gas revolution, of a “Golden Age of Gas”—in the form of a rapid expansion of both supply and demand—is slow to arrive, though there are tantalizing hints that it may not be far off. The LNG industry is dynamic. It is finding innovative solutions to access small markets and deploy more quickly especially in the Americas and Asia. However, while growing slower than anticipated, it is still increasing steadily. Global LNG trade reached a record high of 258 metric tons (MT) in 2016, up five percent, or 13.2 MT, from 2015 due to a significant increase in new supply and growth in regasification capacity. Trade in both 2015 and 2016 surpassed the previous record high of 241.5 MT in 2011 that occurred in the wake of Great East Japan Earthquake and Tsunami. It continued to grow in 2016, reaching 263.6 MT, a 7.6 percent increase over 2015. Japan and the United States are central to these changes—affected by them and in turn affecting them. The growth slowdown shaped the discussion at the recent Gastech 2017 conference in Japan, as did continued optimism over the shale revolution. Trends highlighted at Gastech 2017 included the coming supply surge, low prices, new markets, environment and energy security, contract terms, and Asian trading hubs. These trends reflect the changing global market and the growing flexibility in producer/customer relations brought about by new suppliers, especially in North America, and by an upsurge in new large and small global customers.